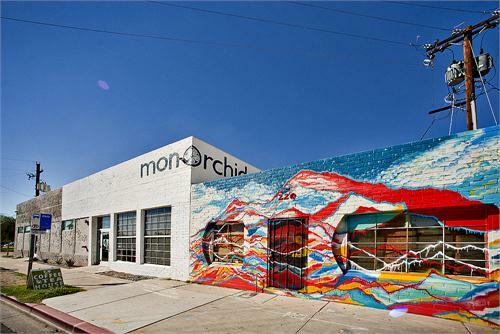 Welcome to The Monorchid, one of the most diverse and accommodating buildings in all of Arizona. Originally constructed by Del Webb in 1937, the 14,000 sq. ft. warehouse is an excellent example of adaptive-reuse at the city’s core. Behind the white brick and striking mural-work of its exterior walls, the building transforms into a multifunctional workspace hosting two art galleries, a parade of loft-level coworking spaces and private offices, a coffeehouse, a restaurant, a conference room, and not one but two full-sized studios for photography or film. Everything about this building and its vision instigates a sense of creativity and community: the stainless steel spiral staircase leading to the loft office pods; the soaring natural wood bow trusses; the unbelievable “hanging conference table” constructed of concrete reclaimed from flooring of the original building structure; the atmosphere and attitude of its staff; the convenience of its location just walking distance from the Light Rail. Enter The Monorchid and you walk into a home away from home, a diverse and thriving culture of its own, a collaborative workspace, a community hub. Be it for a wedding, a photo shoot, a study session, an office or desk space, a film project, a party, or just to grab a steaming cup of hand-crafted coffee, your presence is a welcome addition to the space.